Folks remember 1982’s 48 Hours as Eddie Murphy’s cinematic “coming out party”, but it also marked the high point of director Walter Hill’s career. Never again would Hill enjoy such a nice combination of popular success and critical acclaim. Hill followed 48 Hours with 1984’s Streets of Fire, and that flick crushed any momentum the director carried with him. Fire got mixed reviews and flopped at the box office, as it quickly vanished from movie screens. As a 17-year-old, the kind of ballsy action-drama represented by Fire should’ve been up my alley, but like pretty much everyone else, I skipped it. 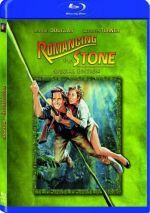 After 33 years, this Blu-ray lets me discover if I missed out on a lost gem. During a concert, rock singer Ellen Aim (Diane Lane) gets abducted by a motorcycle gang led by Raven Shaddock (Willem Dafoe). Urged on by his sister Reva (Deborah Van Valkenburgh), Ellen’s ex-boyfriend Cody (Michael Pare) attempts to locate and rescue her. Tom partners with Ellen’s manager Billy Fish (Rick Moranis) and hired gun McCoy (Amy Madigan) to complete the job. This takes them on a mix of dangerous paths as they seek to accomplish their mission. Fire came out during the golden age of the pop song-oriented movie soundtrack, so even flop films could find redemption via these albums. Though Fire boasted a top 10 hit with “I Can Dream About You”, I don’t think the soundtrack found much of an audience beyond that one tune. At this point, I suspect “Dream” is better remembered than Fire itself, and that isn’t a bad thing. While essentially just a Hall and Oates wannabe song, “Dream” remains a catchy little tune, while Fire misfires literally from its start. The opening concert at which Ellen performs becomes comical in its lack of connection to reality. It seems odd that a hipster rockabilly band boasts a glam female singer, and it makes no sense that this group plays super-melodramatic synth pop. It doesn’t help that Lane can’t lip-synch to save her life. While gorgeous, Lane creates one of the least convincing rock stars committed to film. I get that Hill wanted to put Fire in an “alternate world” that offered an intentionally incongruous mix of eras, with an emphasis on the 1950s, but it doesn’t work. Hill tends to play matters for broad camp, and the results seem silly and free from much entertainment value. Take the many fight scenes. While these should play as lively and exciting, they just come across as goofy, as Hill can’t bring any impact to the sequences. As with Lane’s awful lip-synching, a distinct lack of realism causes problems. I don’t mind the cartoonish way everything blows up good, but I dislike the poor stuntwork, as even simple fight scenes suffer from terrible execution. This means that punches look telegraphed and phony, and auditory choices don’t help. Hill decides to use loud musical “crashes” to emphasize the hits, and this just feels idiotic. I do like the ability to play “spot the minor star” through Fire, though, as it comes with many semi-name actors. Folks like Bill Paxton, Rick Rossovich, Ed Begley Jr., Elizabeth Daily, Robert Townsend and Mykelti Williamson show up along the way – none of them became “A”-listers, but it’s fun to see them. Of all the actors, Dafoe turned into the biggest “name”, and he provides the closest thing to a good performance in the movie, as he adds cool menace to his cartoony part. The rest overact and fail to elevate the material – even the great Rick Moranis seems lost in the wreckage. Not that I blame the actors, as I doubt anyone could turn Streets of Fire into a quality cinematic experience. Silly, contrived and ultimately pointless, the movie flops. 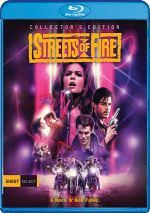 Streets of Fire appears in an aspect ratio of approximately 1.85:1 on this Blu-ray Disc. Though the movie could look quite good at times, it came with more than a few issues. The most obvious problems stemmed from print flaws, as these remained a distraction through much of the movie. Mostly I saw specks and spots, but some other issues also appeared. I’ve seen dirtier movies, but this one still suffered from more defects than I’d expect. Sharpness was generally good. Some mild softness materialized at times, but the flick usually looked pretty accurate and concise. No issues with jagged edges or shimmering appeared, and I saw no edge haloes. Grain looked natural, so I didn’t suspect invasive digital noise reduction. Colors usually seemed nice. The movie opted for a mix of greens, red, purples and blues that worked well for the most part. At times the hues could be a bit heavy, but they mostly gave us pleasing tones. Blacks were fairly deep, while shadows seemed acceptable; some low-light elements could seem a little dense, but they remained mostly smooth. Without the print flaws, this would’ve been a solid image, but those blemishes knocked my grade down to “C+”. As for the film’sDTS-HD MA 5.1 soundtrack, it offered a surprisingly robust affair. Given the movie’s vintage, I didn’t expect much from the soundscape, but it added a lot of information to the proceedings. Music used the front channels in a satisfying manner, and the score and songs also spread to the rear in a fairly useful manner. Effects also largely concentrated on the forward channels, but they moved to the rear on many occasions, especially during action scenes. In particular, explosions and motorcycles zipped to the back and created a good sense of the mayhem. Audio quality showed its age but seemed fine for the most part. Music varied dependent on the source, as the score fared better than the songs. The score offered pretty full tones, while songs tended to be a bit less dynamic. Still, the music worked well enough overall. Speech could be somewhat reedy and showed a little edginess at times, but the lines remained intelligible and were reasonably distinctive. Though effects offered good oomph, they could be a bit distorted at times. Nonetheless, they provided enough kick to do fine. The good outweighed the bad and made this a mostly positive soundtrack. “Shotguns” looks at the project’s origins and development, story and characters, costume and production design, cast and performances, locations. The show also examines music and concert staging, stunts and action, weapons and vehicles, reshoots, potential sequels, the film’s release and its legacy. Overall, “Shotguns” offers a pretty strong examination of the movie. With so much time at its disposal, it gets into a good variety of subjects and it does so with zest and depth. These factors make it an enjoyable and informative program. Next comes Rumble on the Lot: Walter Hill’s Streets of Fire Revisited. In this one-hour, 22-minute and 29-second program, we hear from Hill, Pare, Allen, Lane (1983), Vallone (1983), Laszlo (1983), Iovine (1983), and actor Amy Madigan. During “Rumble”, we hear about the film’s roots and process to the screen, screenplay/story/character domains, cast and performances. It also covers locations and visual design, stunts and action, cinematography, music, and the film’s release. Inevitably, “Rumble” touches on a fair amount of material already discussed during “Shotguns”. Nonetheless, it manages to get into some new details, so it merits a look – albeit one with slightly lowered expectations due to the redundant elements. Five Vintage Featurettes take up a total of 10 minutes, 43 seconds with notes from Hill, Iovine, Laszlo, Vallone, Sosna, and Marilyn Vance. The featurettes look at music, sets and cinematography, the 1st AD’s work, and costumes. Though they exist for promotional reasons, the clips fare surprisingly well, mainly because they offer a lot of footage from the shoot. Three Music Videos pop up here, as we get two different clips for “Tonight Is What It Means to Be Young” by Fire Inc. along with one for “I Can Dream About You” by Dan Hartman. All three just use movie clips with lip-synch footage from the film, so they’re dull as dull can be. In addition to the film’s theatrical trailer, we find On-Air Promos. These take up 13 minutes, 12 seconds and give us notes from Hill, Lane, Pare, Madigan, Laszlo, and Iovine. The “Promos” resemble the “Vintage Featurettes” and touch on cast/performances, cinematography, sets, and music. These come across as more redundant than the prior clips, so they’re fairly forgettable. Finally, the set concludes with a Still Gallery. Presented as a running 10-minute, 22-second montage, it provides 147 elements. These mix movie shots, promotional images, concept art and advertisements. While I’m not wild about the format, we do find a lot of good material here. With a “name” director and a cast of solid professionals, Streets of Fire enjoyed the potential to become an exciting action flick. Unfortunately, it suffers from a surfeit of flaws that turn it into a silly, moronic piece of fluff. The Blu-ray brings us generally good audio and a nice array of supplements but picture quality remains erratic. Not much about this flick works.